OnabotulinumtoxinA is a substance that is able to strip away the negative effects of aging through an injection-based treatment. It is a purified protein that is able to interrupt the communication of signals sent between the muscles and nerves (neuromuscular transmissions). When botulinum toxin is introduced to specific muscle groups it’s able to stop the nerves from telling those muscle groups to repeatedly contract. The contraction of these muscles is responsible for many different problems, including the kind of repetitive strain that leads to the development of wrinkles. A great number of studies have proven the effectiveness of onabotulinumtoxinA on wrinkles. One such study was published in Dermatologic Surgery for the treatment of crows feet and glabellar lines. The study found that patients experienced significant improvements in their perceived appearance, attractiveness and satisfaction rates. Patients who undergo a BOTOX® treatment are able to combat wrinkles as the injection works to halt contractions in a specific area of the face and/or body. Botulinum toxin is directed at problem areas and then begins to work toward providing the skin with the time it needs to naturally soften the creases and lines that have developed over time. BOTOX® begins to reabsorb back into the body in the months following its initial injection and patients must attend follow-up sessions to maintain optimal results afterward. However, you really need just a single treatment to see the improvement, something that has been proven in a study that was published in Plastic Reconstructive Surgery. 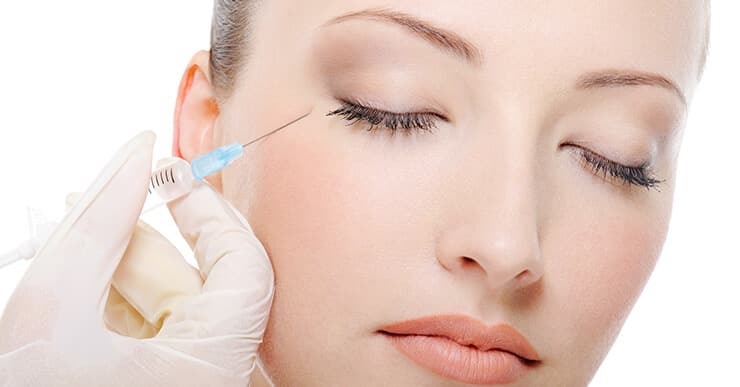 BOTOX® procedures are carried out through injections of the product. These injections are performed with extremely fine, thin needles that are about the size and shape of insulin needles used in treating diabetic children. Treatments usually only take about 10 minutes to perform, are almost entirely painless and consist of a pre-determined number of injections being administered to a target area (the area where problematic wrinkling has occurred). After anywhere between one to fourteen days following the treatment patients begin to see the effects of their BOTOX® injections. Usually, within the first week after the procedure, the affected skin will begin to change gradually, becoming completely noticeable within, at most, two weeks. Although BOTOX® is safe and relatively painless, some patients may experience temporary side effects like minor swelling and bruising. BOTOX® is a temporary product formulated with natural ingredients that help it to avoid causing artificial-looking results. Because of this, its effects begin to slowly dissipate over time. Most patients will choose to schedule followup injections (often three times per year) after about four months following their first appointment. BOTOX® is a powerful cosmetic product, capable of helping patients to look and feel their best in a number of different ways. Despite its incredible variety of uses, however, BOTOX® is often thought to be useful in treating conditions that it’s not actually designed for. Some wrinkles are caused by the muscles but some of them are the result of cellular processes that BOTOX® is unable to help with. Certain wrinkles are caused by protein deficiencies that injectable fillers are designed for correcting. BOTOX®, instead of being used to fill out wrinkles, is meant for use in solving the problem in another manner. Instead of filling wrinkles BOTOX® treats the ulterior muscles that cause them. This means that it is a great resource for clearing away frown lines, forehead lines, crow’s feet and more — but not for actually treating the areas where these wrinkles may need to be filled in. BOTOX® doesn’t work to introduce new fats to the skin of the face even though many people make the mistake of thinking it does. There are plenty of other products that work to plump up the face, adding volume to the lips, cheeks and other facial contours but BOTOX® isn’t appropriate for this purpose. It is able to improve the appearance of the face in different ways though. Instead of making the face appear fuller, BOTOX® treatment can help to “lift” the features, making them appear more youthful in an alternative manner. It can be used to change, lower or raise eyebrows and smile lines and address other common signs of aging. Our skin tone suffers with age and exposure to environmental damage (like the sun, smoke, etc.) and this can cause problems that some may think BOTOX® is able to fix when this isn’t actually the case. BOTOX® is a fantastic option for treating textural issues but it isn’t able to erase skin pigmentation or discolouration. Patients can use BOTOX® to improve their appearance in many ways but should look to other solutions for issues they may have with skin tone. Pore tightening is an aspect of skin improvement that many patients require assistance with but BOTOX® is not the correct solution for it. Among the many benefits available through BOTOX® injection is the ability to manage excessive sweating, a pore-related problem that many may mistake for being related to pore tightening. BOTOX® actually works by affecting glands and does not work to effect the pores themselves.